It took all year, but I finally found it. I found a great animated film that came out this year, that brought me something new to the genre while also being emotional with a fantastic plot. This is the sort of things that I would normally save for the ending, but I know you can see the rating up there, I have nothing to hide. The Breadwinner is a foreign film, about non-American problems, a non average hero, and an above average story. It is the type of film that more people should be hyping, but unfortunately, it is foreign and had a limited theatrical run and most people just want to talk about Coco. 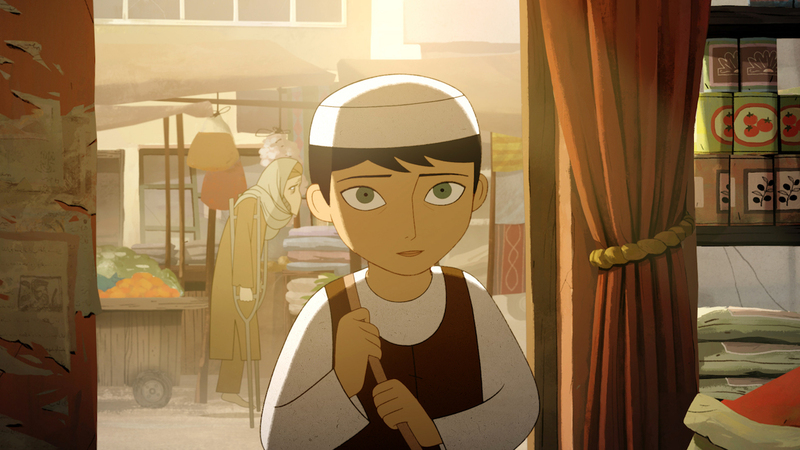 But read on so that you can see what The Breadwinner is all about and get psyched about watching it in the future. This relates in no way to some TV show Breadwinners. Parvana (Saara Chaudry) is a strong independent girl around 12 years old. She knows how to read, she can write, and she wants to be able to do anything she puts her mind to. The only problem is that she lives in Afghanistan, currently under rule by the Taliban, who are getting more and more frequently dickish. They are recruiting younger men, who have a lot of grudges, who are making the area more into a police state. I am not saying early Taliban rule Afghanistan was great, just that it was better than it is now in the film. Parvana knows all of these things because of her father, Nurullah (Ali Badshah), who lost one of his legs previously in a war. She has a mother, an older sister, and a baby brother, but because she isn’t yet fully “mature”, Parvana can join him at the market and help sell goods to help earn money for the family. But at some point, a young soldier gets angry at Parvana for having such a free spirit and not being covered “Enough”. This leads to a Taliban raid of their house, where they find forbidden books, so they arrest Nurullah and take him to a prison far away. The family is left defenseless and hungry, given that the next male in line is less than 2 years old, and none of the others are allowed to buy goods, or even leave without a male escourt. Their family may die poor and alone. But not Parvana. She is resourceful. She chops of her hair, dresses like a boy, and finally gets to feel that sense of freedom she has always longed for. It is up to her to provide food and money for her family, while also figuring out how they might help their father out of prison. Also featuring the mouth sounds of Kanza Feris, Kawa Ada, Laara Sadiq, Noorin Gulamgaus, Shaista Latif, and Soma Chhaya. To really commit, she should have grown her beard like how all 10 year old boys do. In The Breadwinner we get a regular story about a girl going above and beyond the call of duty, to protect her family and try to make things right. This isn’t some goddamn princess in her ivory tower discovering how to be good, but a girl who has lived a hard life and still rising above it all. This is set in the real world that has real issues, even if the setting is no longer accurate. This is the type of story that can resonate with the youth of the world regardless of their age while also providing factual knowledge. And even more importantly, it is not a cookie cutter story. We get violence that might seem a bit extreme for a PG film, even if it is “off camera”. We have a goddamn war zone with people running around with automatic rifles and a high assumed death count. Their entire family is put into realistic peril several times, because that is the world they are living in and it is downright frightening. It also has a story within a story, giving us a different art style, to sort of break up the main story into sections and give us a parallel to compare things to. A common idea and one that works wonderfully in this film. But most importantly, the ending really resonated with me. Everything didn’t magically fall into a place and it certainly isn’t a situation where they lived happily ever after. They didn’t somehow cause the Taliban to disappear and run off into the sunset. It gives a realistic enough ending for them, without giving us the picturesque fairy tale finale. This is an animated film that took some risks and they paid off. And it took Canada, Ireland, and Luxembourg to work together apparently to give it to us (not: no middle eastern countries made this movie about Afghanistan). I didn’t know anything actually came out of Luxembourg! But I am excited for whatever they brought to the table because now I have the Luxembourgian tag on my website.